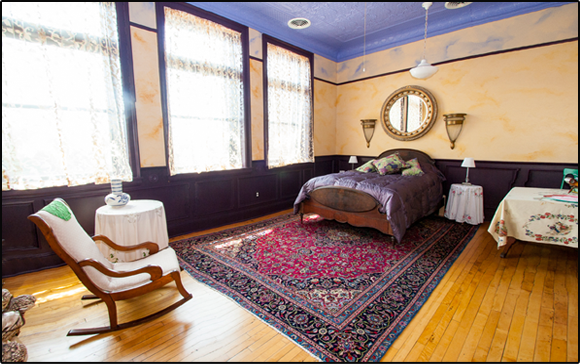 All of the rooms have full baths, 12’ high vintage tin ceilings, ceiling fans, thermostatic control, warmth & personality. One room has a standard tub & shower; one a hand painted claw foot tub with hand held spray & two rooms have large Jacuzzis with hand held spray. You may reserve our guest rooms by emailing us at inn@cannon.net, calling us at 715-448-2608 or use our on line reservation option. Gift Certificates: Available in any amount beginning at $25. If a balance remains it may be applied toward merchandise or we will extend a refund to the gift recipient upon request. There will not be any refunds for full unused gift certificates. Some restrictions may apply. Living in the north stimulates certain Scandinavian urges. 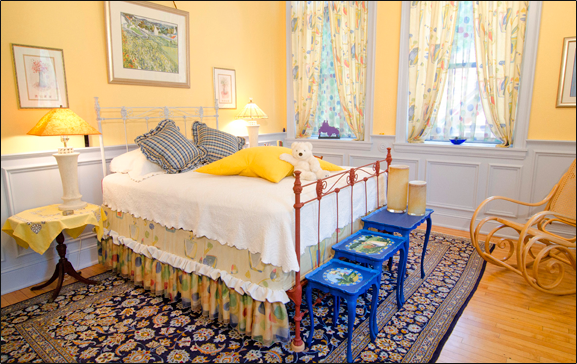 Our inn wouldn’t be complete without a Yellow & Blue guest room. Sun Shower is playfully decorated & has a sweet energy & sunny feel to it. Being in the room brings out that “Yaw shurrr, Youu betcha” in everyone. Be sure to sit in the old Tonet rocking chair. You won’t rock any better than a Tonet. 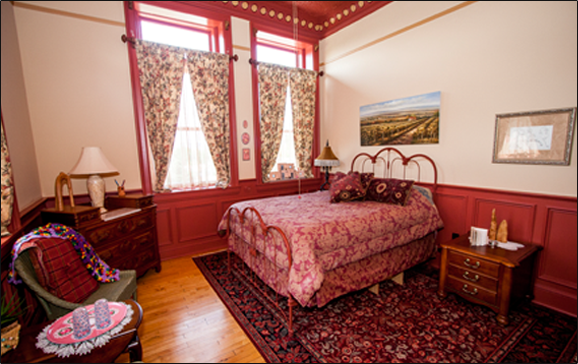 Sleeping is so comfy in the high, old wrought iron, queen size bed with bed-steps hiding beneath the bed skirt. There are 5, yep five 8’x4’ windows in this room. The bathroom is in white tile with the palest of blue gray walls. There are hand painted mirrors on the walls. A bright yellow and red plaid shower curtain is delightfully finished with what I call “Ruth Ann” rick rack (Lily Tomlin’s little girl?). Oh yeah, this bathroom has the standard white porcelain tub and tile shower. This is the one guest room that we have with a shower. This room is on the lake side of the Inn overlooking our quaint Maiden Rock Village with a good view of the Mississippi River. 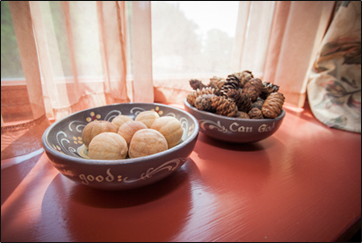 The color of the intensive millwork in this room reminds me of Oklahoma red clay. 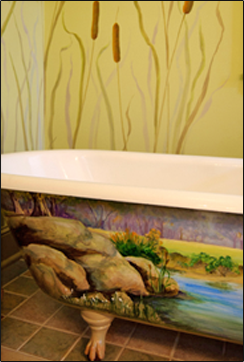 The walls are a soft warm palomino buff & the decorating is salted with earthy spicy hues.Slipping into the hand painted vintage claw-foot tub may seem like you have discovered a cool clear pond hidden away among reeds & cattails. The vanity is an original design, featuring Australian Cypress. The room is lit with hand painted antique wall sconces. Catch a glimpse of yourself framed in the coordinated hand painted mirror with an eagle perched atop. Our area in the Mississippi River Valley is known for the large population of eagles as well as many other incredible migrating and indigenous birds. We are located in what is known as the bird migration flyway. Sleep like a king in this queen antique wrought iron bed. Be sure to use the bed steps; it’s a tall bed, built for our royal guests. 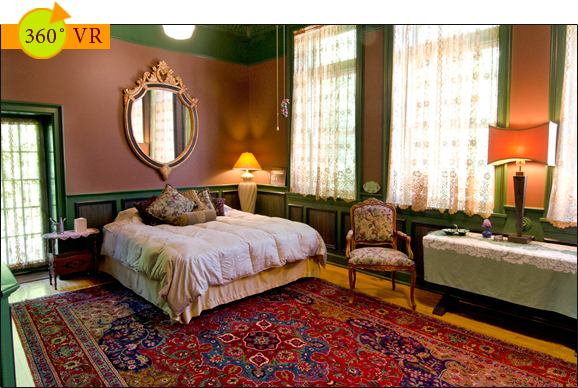 15% reduction in price for the third night and any additional nights thereafter. Peak rates also include all Holidays & Special Event Days in our area. This room’s name “The Aubergine” was chosen for a couple of reasons– the room’s main color is a sensuous eggplant, and the room also has a feeling of Europe/the Mediterranean. For some odd reason I am reminded of Peter Pumpkin Eater when I think about sleeping in an eggplant, an aubergine. Oh well. 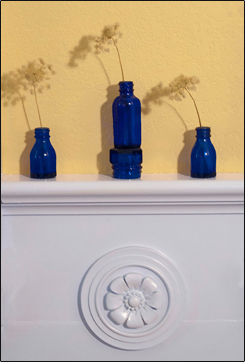 The walls are faux-painted in the colors of sweetened condensed milk pushed into golden topaz dust. 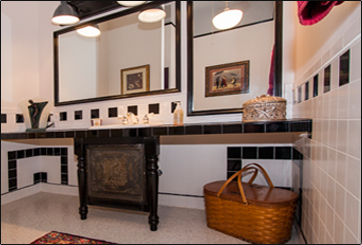 The closet is handsomely designed by my handsome husband who created built-in drawers for you to put your stuff in.The bath has a grand Jacuzzi built-in with shiny black & white tile, off-white walls & a gray ceiling. 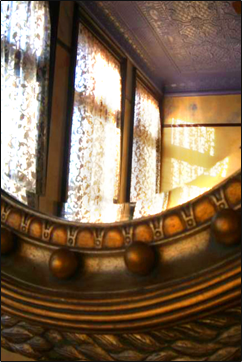 Many mirrors & abundant lighting line the bathroom’s interior.Peer through the gold lace curtains over Maiden Rock and across the Mississippi River Valley at the Minnesota Bluff… Welllll…..it’s not a bad view.You will sleep in a lovely old wooden queen-size bed. This bed is a real good sleeper. As a matter of fact, maybe you should sleep in another room or you’ll be late for breakfast. If you are staying in “The Grotto” room you can step outside onto a landing overlooking our grotto. You will be surrounded by limestone walls & the bluff side, thick with woods inhabited by many different types of songbirds & little creatures. 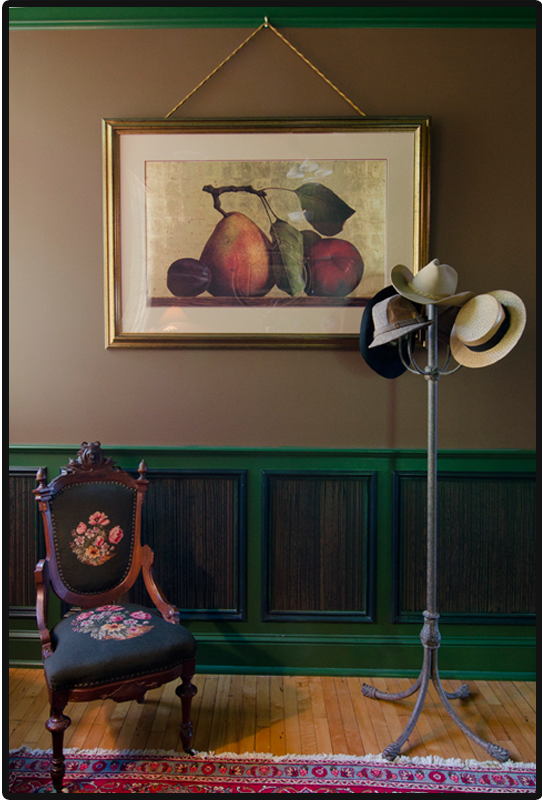 Stepping back inside your room you will find yourself enveloped by millwork galore and a generous vintage tin ceiling; the room is dressed up in deep, robust, earthy tones of green, chocolate brown & charcoal – all fancied up a bit with some thick faux painting in the panels. Sound a bit masculine? Well it is. 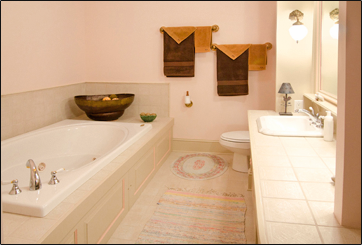 But, there is a feminine aura dancing through “The Grotto” with wonderfully soft & elegant bedding, bronze lace curtains, delicately hand painted water glasses & a bathroom big enough to host a tea in.The bath colors are pastel puce & the quietest of pinks. Glowing recessed lighting & vintage vanity sconces light up the bathroom delightfully, quietly shedding a sheer pink light over the bedroom ceiling through antique Carnegie Library windows as you slumber. Be sure to bring your flippers, goggles & snorkel as this giant Jacuzzi is big enough to swim in (sorta). Whew, after all that exercise you’ll probably wanna crawl into that big ole king size bed & go to sleep.